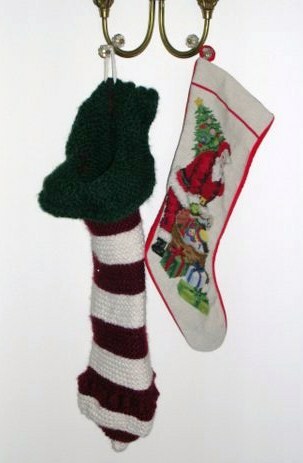 Just in case you thought I was exaggerating in my post yesterday titled The First Stocking, I received an email from my mother this afternoon with a photo. After all these years, the elephant condom stocking was found and it wasn’t hanging in the elephant house at the Zoo. Go figure! Discovered last week while organizing her holiday decor, my mom found the stocking buried at the bottom of a box of her decorations. She had planned on bringing it down for Christmas to surprise us with a good laugh and a walk down memory lane. While she’s still bringing it along for the holiday, at least now I’ve got a photo to share my exquisite work of art. Elephant Condom Stocking shown next to an example of an appropriately sized and shaped stocking. Thanks Mom! Cheers and Happy Holidays Folks! I’m still laughing….I love it. What a wonderful story to pass on to the kids when they are older. Have a wonderful holiday and greetings to both of your folks. I loved the story and it started my morning off with a laugh….I’m laughing again at the picture of that beautiful elephant condom….thanks for a good afternoon giggle! Any elephant would be happy to have such a thoughtful gift. Thanks for the great laugh. Really laughing out loud!!!!! And the ribbed comment is hilarious! I am so glad that she found it! Wow. I’m so glad there is photographic evidence of this. AHHHH! That’s great. and thanks for the chuckle as always, you crack me up! That is quite a stocking there chiquita! Omg, it DOES look like a condom for an elephant!!! Hysterical!! I love it! I LOVE the elephant condom stocking!!! I think handmade mishaps are the best. Oh my…..thank you so much for sharing. It is even ribbed. Adorably hideous comes to mind. I’d like to order two please. hahaha I think it’s perfect!!!!!! It is beautifully…uh…striped! Big smiles. Happy Holidays to you too Jen!